Today it’s eleven months after I arrived in Paris. I’m safely back home in my adolescent bedroom, which is crammed with my adult possessions. Like the Princess and the Pea, I sit on top of my queen mattress, which is on top of a double mattress, which is on top of the double bed my mum bought for this room when I first moved out (climbing into bed is now a perilous exploit). I’ve been applying for jobs online, finally ready to grow up and settle down for a while. I might teach again but, assuming everything in Melbourne goes to plan, it will probably be a career-break in a few years, rather than a continuation of a long and not-so-prosperous teaching career. Consequently, not only is it the end of this journey, it’s the end of this blog. A big thank-you to everyone who read – I hope that it’s been useful, or at least entertaining, for people considering giving TEFL a try. Although I’ve loved having a regular writing project, I don’t think it’s appropriate to keep updating Jolie à Paris when Jolie is no longer à Paris. This was originally supposed to be a TEFL blog and, although writing while I was backpacking was a bit of a stretch, writing about my life in Oz is probably a stretch too far. That being said, if I start a new blog, I’ll let you know. So, 11 months, 23 cities, 76 students and 372 classes later, and I feel like I’m back where I started. A 24-year-old Aussie girl who has just returned to Melbourne. Find a room, find a job, find l’amour, drink wine and be merry – should be a piece of cake, non? I had a final stop in Paris before going home. Originally I was hoping to spend time meeting up with the teachers from BTL for drinks, getting a last chocolat chaud with Mr Frog, and maybe a drink with Manuela. But when I sent out texts, I discovered that neither Mr Frog nor Manuela would be in Paris. And of the seven teachers that I considered to be the core of our group at BTL, two had already left Paris, two were flying to Toulouse on Friday, and I didn’t have one’s number. D was going back to London after Rome and I panicked – how could I spend four days alone with nothing planned? Eating out has always been a social activity for me, so it was off the list. After two and a half months of being a tourist, I didn’t want to see museums and monuments. Especially not ones I’d already seen. I didn’t want to spend the next four days agitated, especially with one of the world’s longest flights ahead of me! So I changed my flight home and breathed a sigh of relief. I would only be in Paris for two days now (or one and a half, if you subtract airport time). 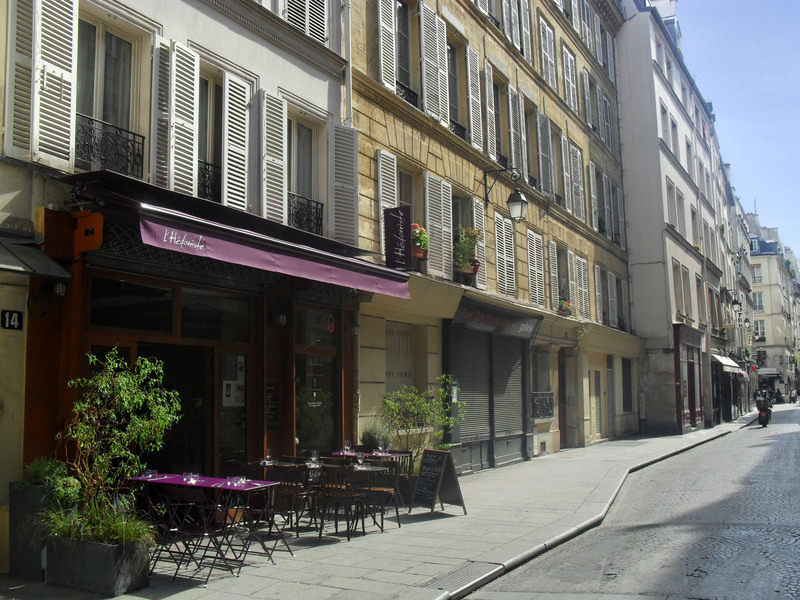 Then I reached my hostel, on a beautiful street in the 18th at the top of a tree-lined staircase, neighboured by a brasserie and an up-market boulangerie, with a chocolaterie, a couple of bars, and several fruit shops down the road. Out the window of my dorm room was a vista of lead roofs, brown chimneys and dark windows. I felt that familiar thrill. Oh why had I worried? My one and a half days ended up being plenty of time, and it was probably better that I spent them alone, as I was deep in thought and my emotions rocked in waves. afternoon. As I walked I could smell the perfumes of pungent cheese and dark chocolate when I passed open shop doors. The market produce shined brightly, colours ripening in the sun. It all seemed so familiar to me. Whenever the breeze rose, I felt as though I was swept into a lover’s arms and waltzed down the street. I could travel for another month. Even two! There was so much more I wanted to see! At Place des Vosges I ate a light and sweet strawberry mille-feuille and one of the best sandwiches I’ve had in Paris (courtesy of Boulangerie St. Antoine) – no need to toasting here, as with many of Italy’s day-old paninis – the bread was crunchy and the ham, gruyere and salad so fresh that no dressing was necessary. I returned the phone that a former student, Marie Maud, had lent me when mine broke in February, and learned that she was engaged and planning to move to London. 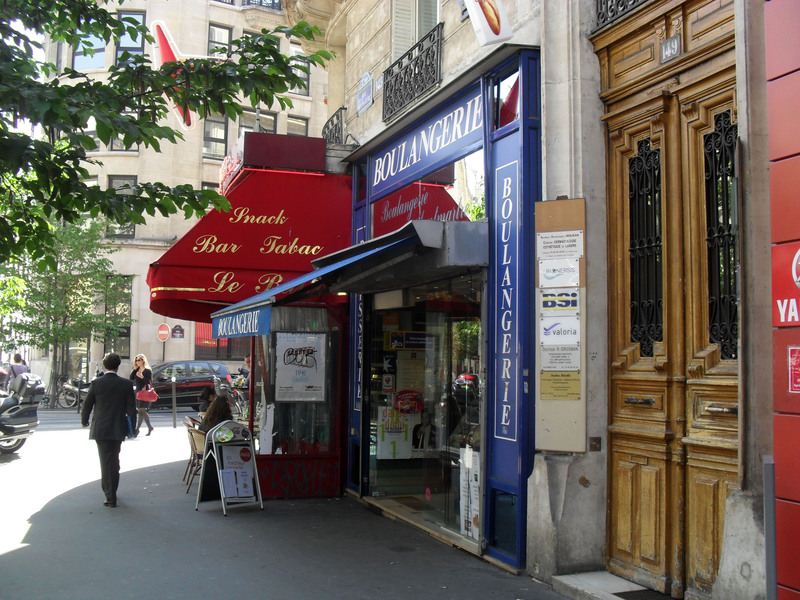 When I closed my bank account, the ease of the process made me so jubilant that I did a little dance on Boulevard Haussmann once I’d surrendered my carte-bleue. Then my mood would start to descend. 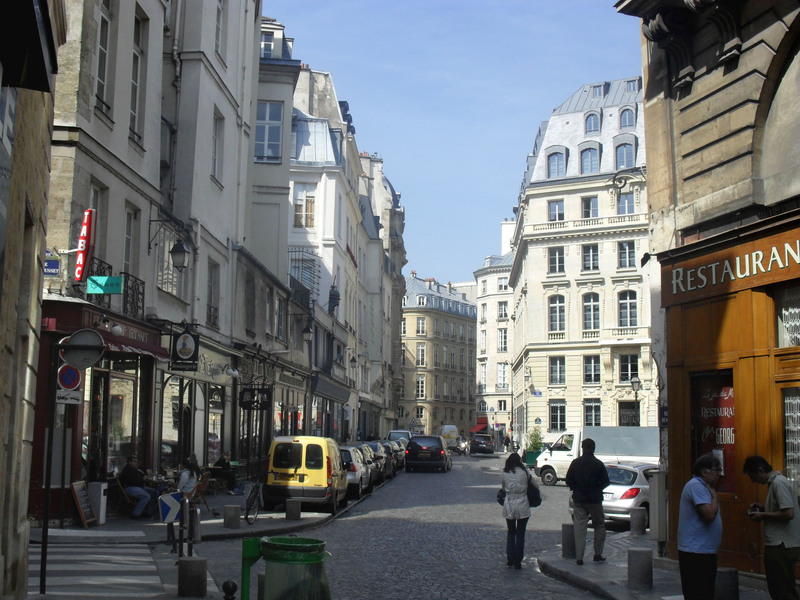 When I came upon Rue du Pot de Fer and wandered down it for the first time, I wondered how many more streets like this the city was hiding, just waiting for me to discover. 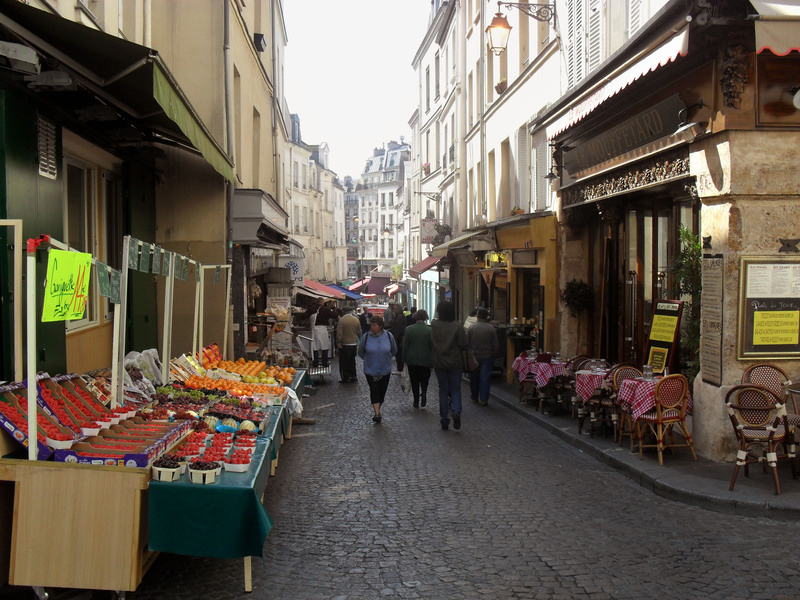 I turned down Rue Moufftard and decided that I liked it even better than Rue Montorgueil, my previous market-street favourite. Paris beckoned me. She had seduced me time and time again, and now it was my turn. She smiled coyly, flashing a bit of calf as she crossed her legs, leaving her skirts below her knee. Stay a little longer – give me a look, a smile, a touch. Pause a moment, and I’ll tell you my secrets. The leaves whispered as they rustled in the wind, and I debated whether I was leaving too soon. 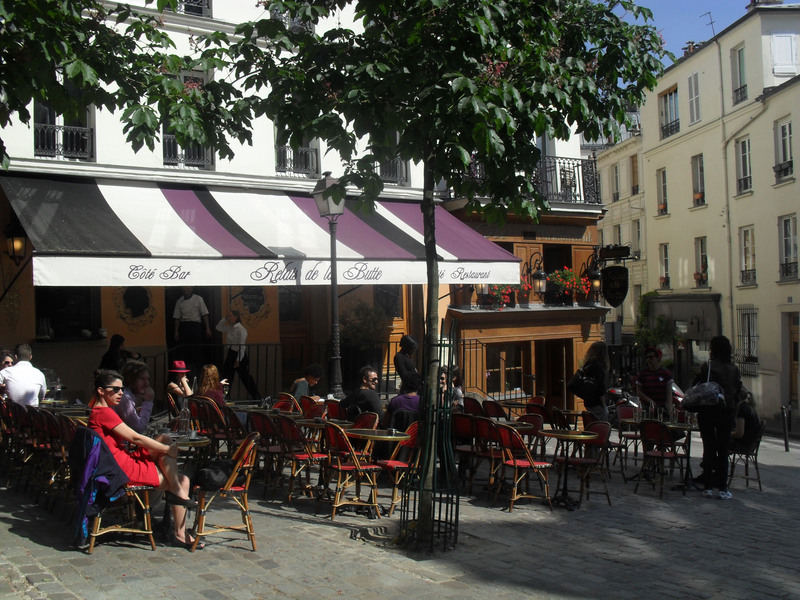 After nearly nine months in Paris I was still an outsider – was I walking away from my chance to get in? My chance to sample a French life? Then I would sink into the troughs, tormented by worries about going home, and haunted by ‘what ifs’. As the afternoon crawled in, I started to feel as though I was losing a loved one and at some moments the grief was so acute that I ached to curl up and lick my wounds. And then I would be happy again, soaring on the crest of another wave. That day I walked around Montmartre, down to the Parc Monceau then Boulevard Haussmann, past Madeleine and Place de Concorde to the 5th and 6th arrondissements, then to Bibliothèque François Mitterrand and Parc de Bercy before heading back through Bastille, Le Marais, Les Halles and up Rue Montorgeuil and Rue Montmartre. In the evening I left for another walk around Montmartre. That night I collapsed into bed exhausted. And I worried about my return to Australia. When I returned from London in 2009, it took me some time to find work, and then I’d only done it with help from my mum and her contacts. I’d never imagined that I’d have trouble finding a job – it shattered my confidence, and this affected several areas of my life. I was determined that this wouldn’t happen again, and formed a plan of attack as I fell to sleep. The next morning I woke, feeling at peace. In the few hours before my flight I strolled. 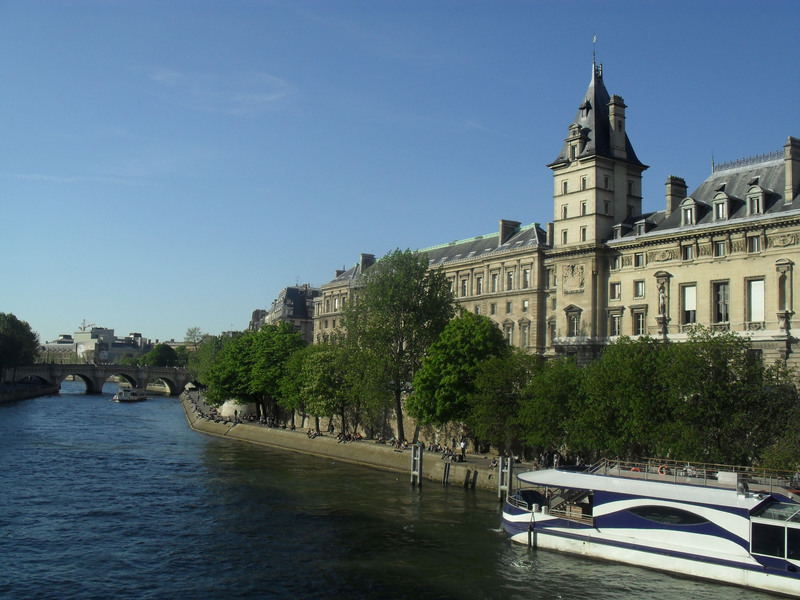 Yes, Paris was still alluring, but I didn’t feel as I’d felt the previous day. I was no longer torn. Paris and I had had a brief and beautiful affair. But it was over. This could have been the slogan for our stay in Rome. We weren’t having much luck. I first went to Rome three years ago. 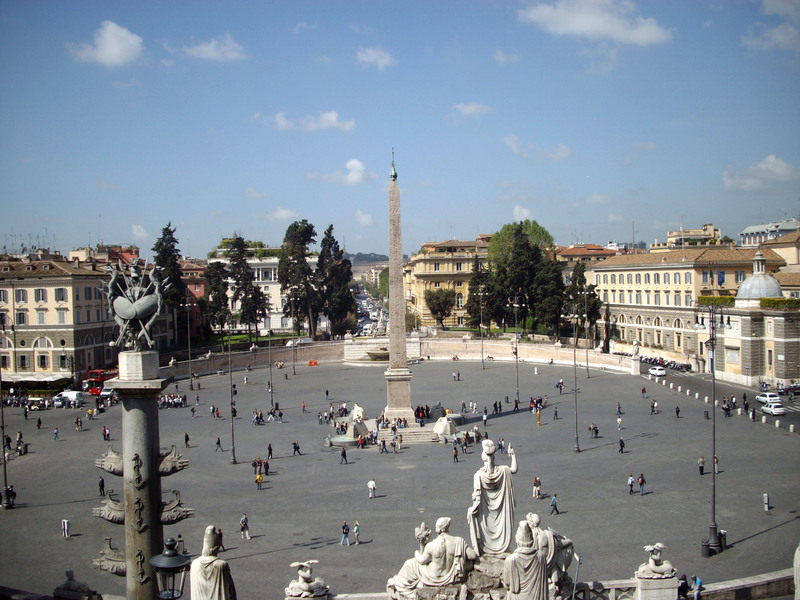 On my second visit, the impressions left by the first were still fresh – I remembered the graffiti (though Rome was sparkling clean in comparison to Naples), the dismissive attitude of sales girls and the persistent men. 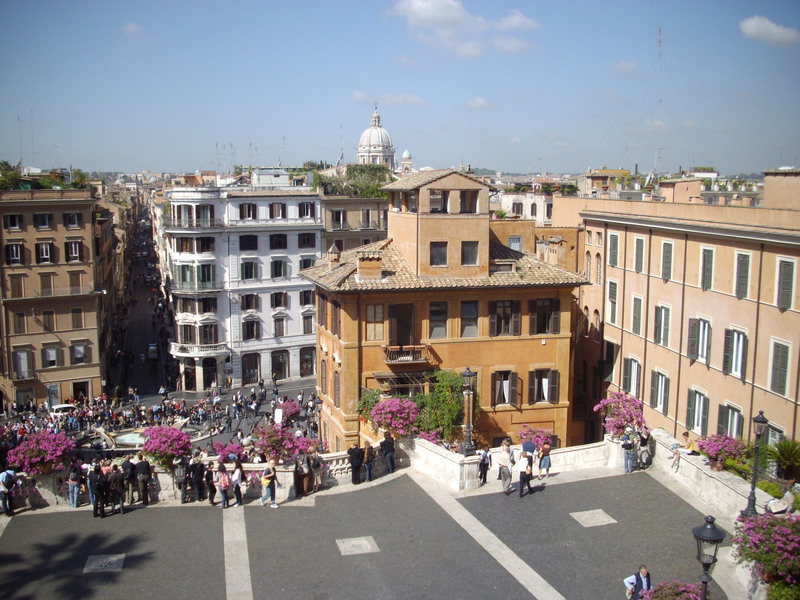 I remembered how relaxed life seemed to be here, and felt as though Rome was a coastal city. 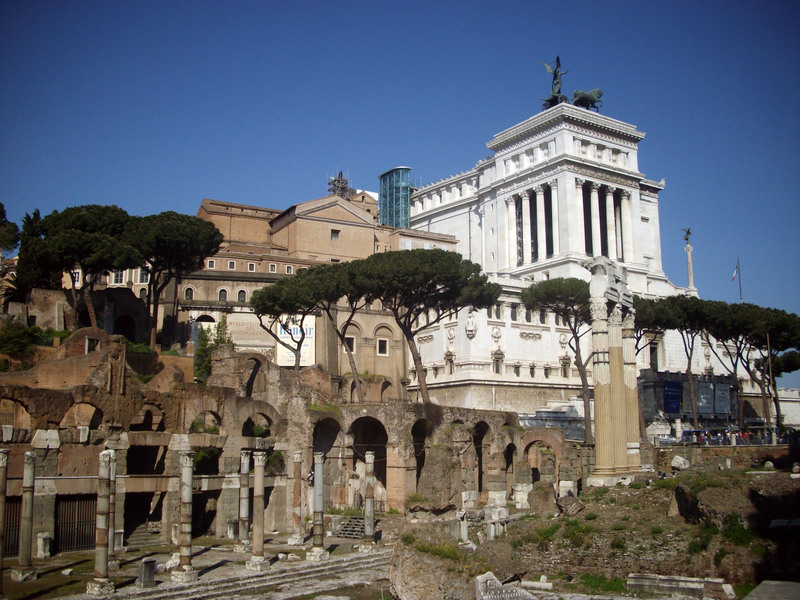 I fell in love with the city when I sat reading on a patch of grass in front of the Foro Traiano and a man told me I had skin like mozzarella. 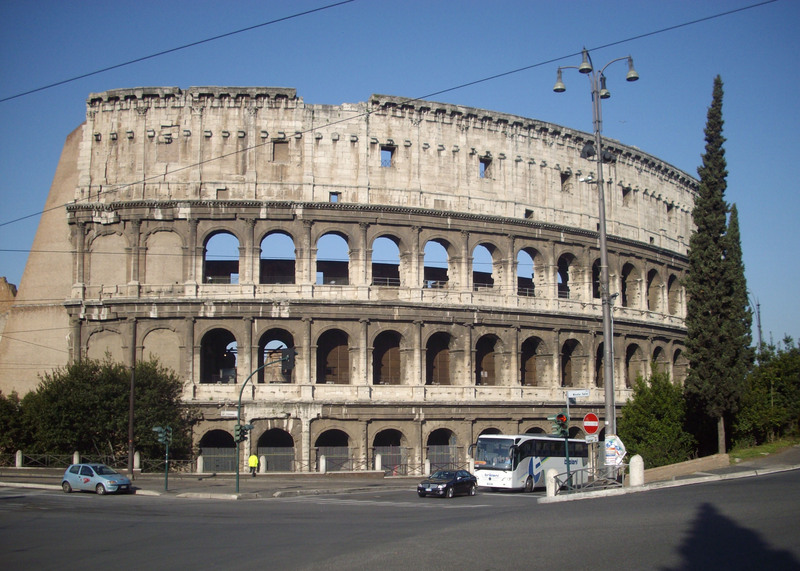 I remembered being blown away by the size of the monuments – I’d never seen anything as large as the Colosseum, each of the arches in the walls at least three or four times my height, and the walls metres thick. Surrounded by parks and the Foro Romano archaeological site, I was shocked to discover that it wasn’t on an empty, sandy plain. This time we sat outside the Colosseum (the line was too long to go in, and we didn’t want to pay for one of those ‘skip the line’ tours) and an old New Yorker sat next to us. Apparently he and his wife visited Rome 45 years ago – back then the Colosseum was free, the arches were completely open (now bars line them) and there were about ten people there feeding spaghetti to 300 cats. 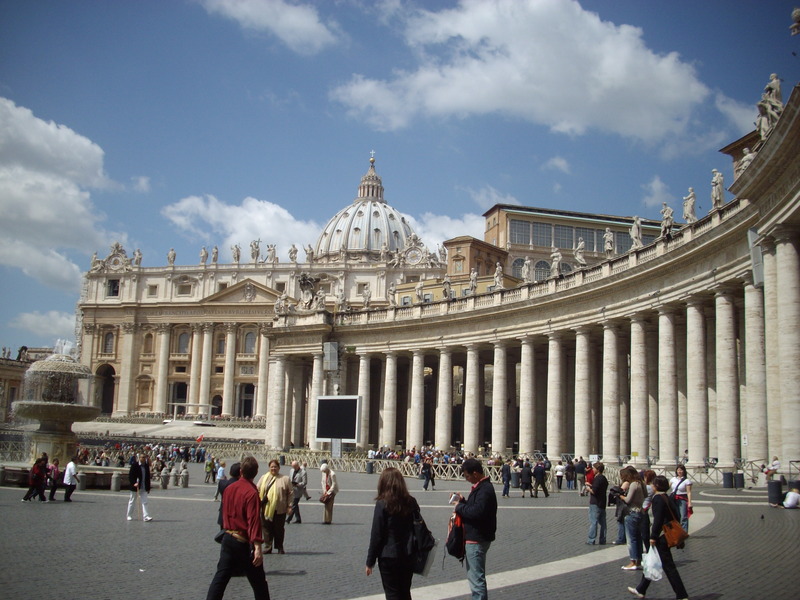 Saint Peter’s Basilica was the largest church I’d ever seen, sitting behind Rome’s largest piazza, walled by a colonnade and with fountains and an Egyptian obelisk in its centre. Like Saint Paul’s on steroids, it was beautiful with elaborate mouldings of angels on the walls and ceiling, and light streaming in through the arched windows lining the top of the walls and circling the dome. The cavernous crypt below the basilica was like a maze – each pope’s tomb housed in a separate arch, and each unique. I loved the history. 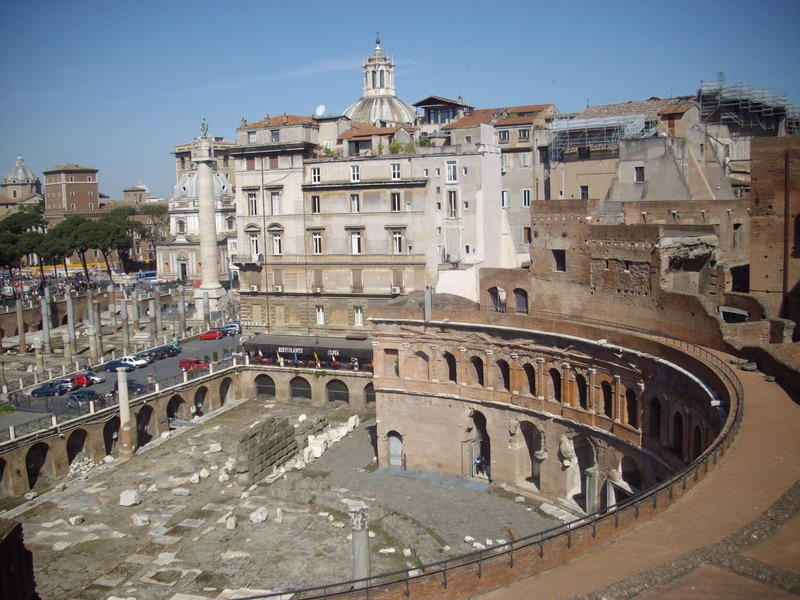 Europe abounds in history, but this was the first time I’d seen ruins, both in Rome and a day trip I did to Pompeii. 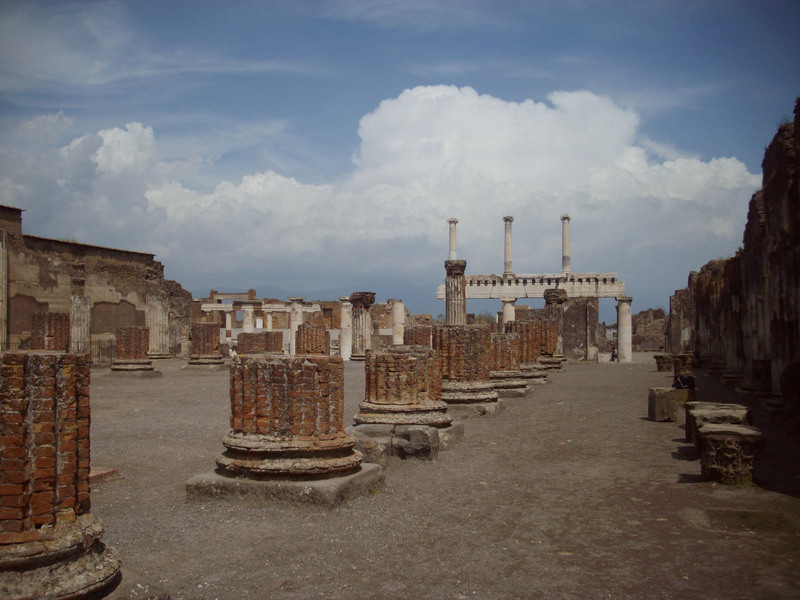 The ruins of ancient Pompeii cover an area of about 70 acres, which means some places have large tour groups standing around, and other places where I could be completely alone. I spent four hours getting lost there on my first visit, never before having realised that this was a fully functioning city with streets, houses, spas, arenas, a brothel, parks and a beautiful villa. I loved that I could get so much closer than in any museum – being able to walk around the houses and under the arches, to touch the marble pillars and the fossilised furniture. 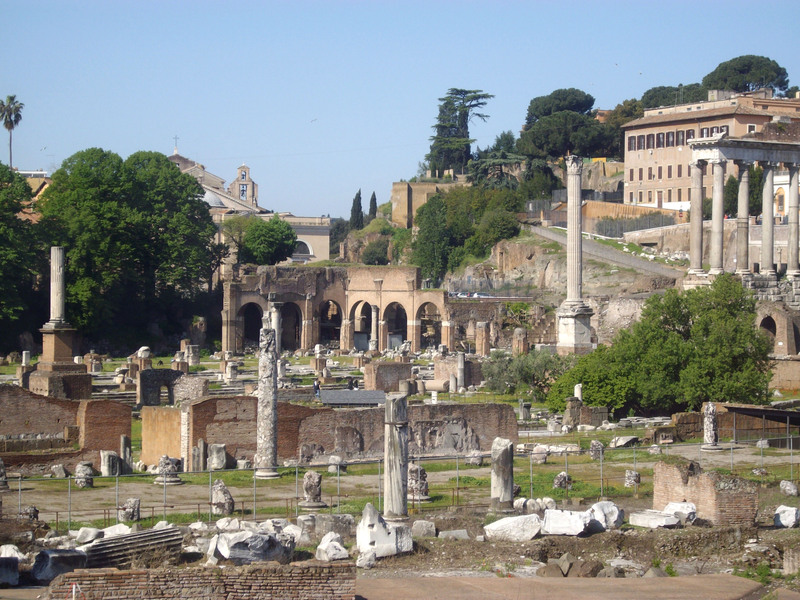 So my favourite part of Rome was the Foro Romano, Rome’s own archaeological site. I was curious to see whether D would be as awestruck as I was. To be honest, he didn’t seem to be (though he might just express it differently – after all, we can’t all walk around with our jaws hanging slackly and our eyes as wide as saucers). Not having internet had put a damper on our stay, and in Italy we’d started feeling swindled by entrance fees and the limited access they provided (can we see the Vatican City? Is not possible. Can we skip the line to look at prices? Is not possible. Is there a youth price? No). However, the main objective for this trip to Rome was to eat well, and that we did. True, we had some unfortunate supermarket food, and an old Panini, but when we ate out it was always a pleasure. I bought gelato at L’Ourso Bianco, where you can get three flavours for €2.50, catching dribbles of the melting ice-cream running down my cone on my tongue. The biscotti flavour was divine. It was so much better than Rome’s oldest gelato shop, Palazzo del Freddo di Giovanni Fassi, in business since 1880. There the flavours weren’t labelled, and I felt rushed by the impatient sales girl who gave me strawberry sorbet when I wanted strawberry ice-cream. 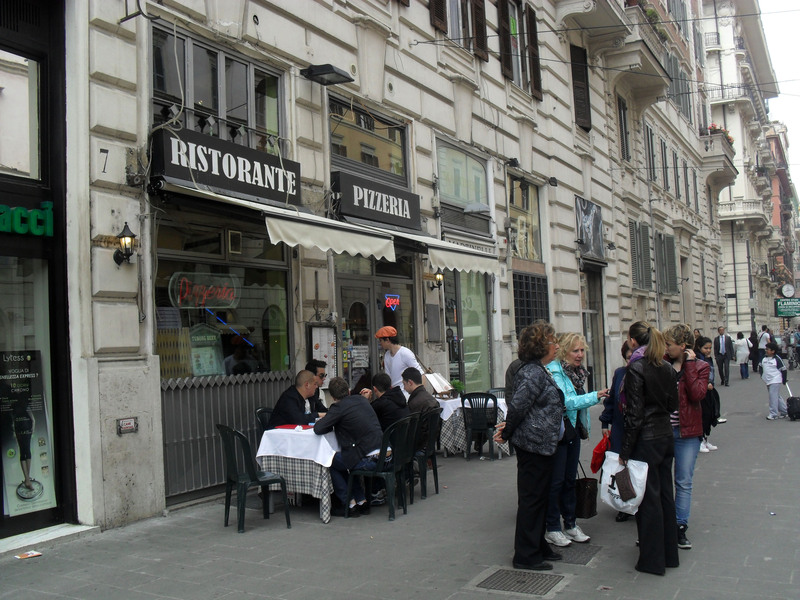 When we searched for a decently-priced restaurant near the Spanish steps, we walked past Piazza del Poplo and found a place near Flaminio, which didn’t seem to have a name. We entered and, immediately sensing we were tourists, the barista pointed us upstairs. We reached a restaurant filled with square tables covered in red and white checked tablecloths, the patrons largely Italian – a group of elderly ladies behind me, and a group of business men who could have been the mafia in a US television series behind D.
The bread was served with olive oil and balsamic vinegar. We were seated on the second floor, surrounded by tables of locals. D ordered a mozzarella and prosciutto appetizer, a tomato salad, and a penne arrabiata. I ordered a spaghetti carbonara and decided to see how I was feeling afterwards before considering the home-made tiramisu. I’m so glad I did – it was the best carbonara of my life. The bacon was salty, smoky and crunchy. The spaghetti was still chewy in the middle. And the sauce was scandalously runny, steam escaping whenever I stirred the pasta. My mouth sang as I ate, and I tried to decipher the recipe, wondering how something so simple could taste so good. The tomato sauce was as sweet as the salad and, although I didn’t get any chilli flakes in my sample, the spiciness had bled through the sauce in its cooking. Halfway through my dish and I was stuffed, and mournfully declined the offer of dessert. Realising that the cheapest restaurants were near the Colosseum, on our final night we returned to a small restaurant called Luzzi’s. The first time we were drawn to it by the blackboard on the street advertising their €5.50 lasagne (I don’t recommend it – picture a stack of cooked lasagne sheets with a tomato and meat sauce poured on top). However, D had an incredible beef Carpaccio and we decided to try it a second time before we left. “Can I get the Bacala?” D asked, the one dish he wanted that he hadn’t found so far in Italy. It was on the menu, but last time it hadn’t been available. “Okay, then I’ll take the minestrone soup and the beefsteak,” he said. “And can I get the prawn and cream risotto?” I asked. D shook his head with a grin, “I think we can safely assume, is not possible!” he cried in an accent that was closer to French than Italian. I later ordered a tiramisu and, despite the lack of possibilities, it was blissful. Instead of using sponge, like I’m used to, they used some sort of biscuit – cake-like in the centre and crisp around the edges, like Madeleines, but thinner. The contrast between the crispy biscuits and the creamy mascarpone was heavenly. As D finished, the rain bucketed down and we schemed a way to stall as the people waiting for tables glared at us. “Coffee?” I suggested, as I’d promised to try it before we left Italy (as you’ve probably guessed, I’m a hot chocolate person. We left laughing in the rain, me sheltering under my suede cap and D using our plasticised tourist map for cover, crying “is not possible!” at regular intervals. An umbrella-seller approached us and sold D a baby pink umbrella for €5. A few minutes later, the rain stopped. So clearly, some things are possible. When we left Naples Central Station at 10pm, the soundtrack of my life played two deep notes of foreboding. Before us stretched a large square. Half construction site and half dump, black rubbish bags piled against the inside of temporary wire fences like reinforcements. The streets were awash with trash – white shopping bags blew along the pavement as it started to spit and brown pieces of cardboard grew soggy around the edges. The ground was awash with foil and plastic food wrappers, cigarette butts lined the creases between concrete slabs, and dented cans lay in the gutters. We waded through the sea of waste as I wondered what I’d done. Unfortunately for Naples, the impression was made. Although I enjoyed walking through the old town and we visited Pompeii, the image that will stay with me is me dragging our suitcases past the transvestite prostitutes on the first night, hoping that my expression was one of polite indifference. 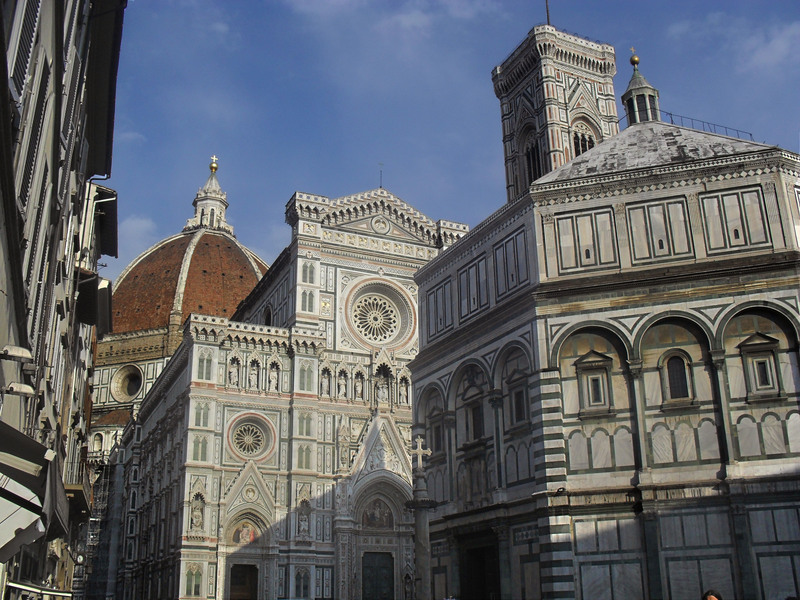 Florence was crammed with people. At first I thought it was just Easter Monday. But Tuesday was almost as bad. And Wednesday. Even the pedestrian areas needed traffic lights. 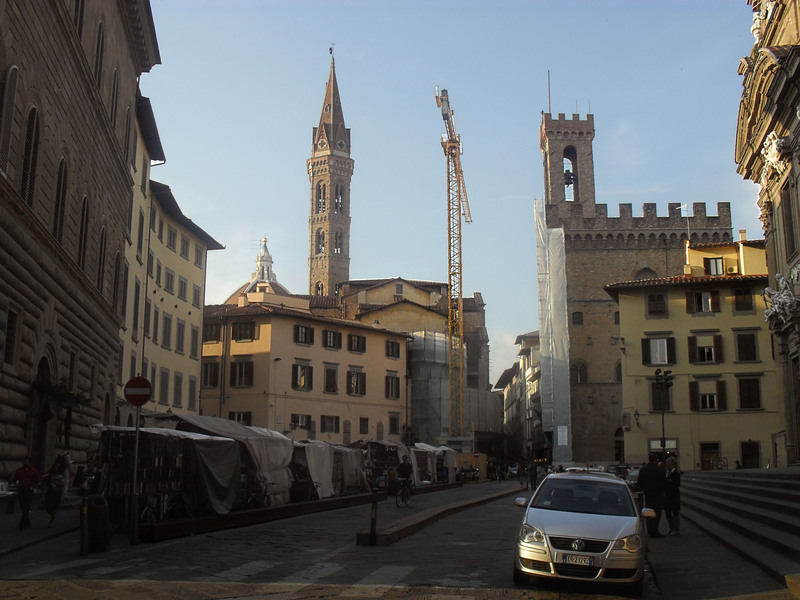 As always, turning down the streets away from the main monuments was when I really got to taste Florence (admittedly, the entire historical centre is quite touristy). The Duomo (main cathedral) was beautiful, and so big that, even at the opposite end of the square, I couldn’t fit it all into my camera. Made of white marble and decorated with stripes of pink and green, reminiscent of the Italian flag. 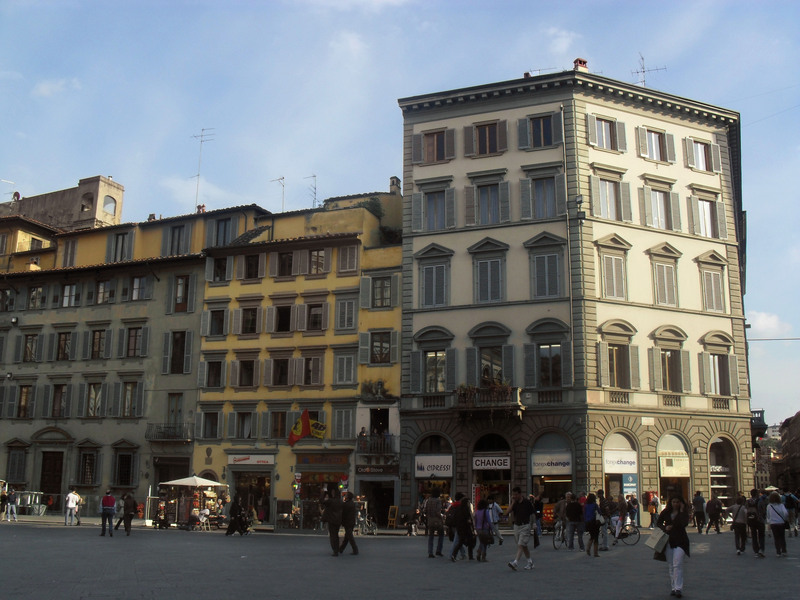 However, we had more fun after turning away from the Duomo to Via de Martelli, where we discovered Lombardo’s, one of several shops in the area that sell traditional Tuscan food. The shop was divided into three sections – the first had one wall of wine, one wall of sliced meat, and a central table filled with Italian cheese and sausages; the second had a wall lined with jars of sauces, olives, roasted capsicums, stuffed bell-peppers, marinated garlic and other mysterious things I couldn’t identify with labels I couldn’t translate; and the back of the store was filled with chocolate, dried pasta coloured in ribbons of white, red and green, and biscotti that smelled heavenly through its plastic bags. On the central table in the first section, there were two cake stands with clear plastic covers. One held five saucers with cubes of different cheeses, and its neighbour displayed samples of different salamis and a cured ham. Like children in a chocolate shop, we went crazy on the samples, tasting every type of meat and half the cheeses. When the saleswoman came to help us, we were all ears (tongues?) as she told us about a traditional sweet balsamic dressing, and poured the black syrup into teaspoons for us to taste – like the tang of balsamic vinegar mixed with the sweetness of honey, it was divine with a mild cheese and she also recommended it for salad and ice cream. Later she recommended wines, and we tried one white and three reds before walking away with a bag of goodies for dinner. So when we strolled through the centre we avoided the huge churches, instead navigating streets lined with shops and restaurants. D kept having to drag me away from the Easter displays with 50% off signs in the windows (even the Lindt store had 50% off! Unfortunately all of their Easter eggs were so big that I don’t know where I would have packed them), while we both slowed whenever we saw interesting cheese and salami, or to compare prices on menus. The restaurants were predominately self-service places and, although the pasta, pizza and salad looked like they’d been sitting for a while, the desserts looked scrumptious – glasses held individual servings of tiramisu, fruit salad, or layered fruit, cake and cream topped with wafers. And the gelato! Yes, you can find it everywhere in Italy, but here giant creamy mounds towered in their tubs, and all of the fruit flavours were topped with slices of fresh fruit – cantaloupe, pineapple, strawberries, banana – while other flavours were drizzled with sauces or sprinkled with crushed biscuits. My criteria for a good gelato place became whether or not I could smell waffle-cones cooking, and then I found myself drawn to the shop by my nose. 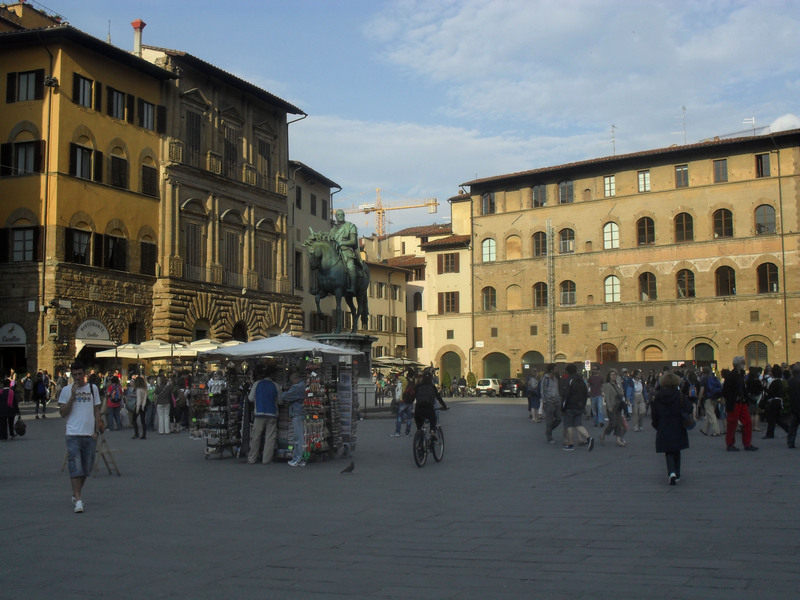 It was the same thing when we walked around the colonnades of the Uffizi Gallery (where Michelangelo’s David now rests, and which we avoided due to the discouragingly long line) to the river to see the Ponte Vecchio. 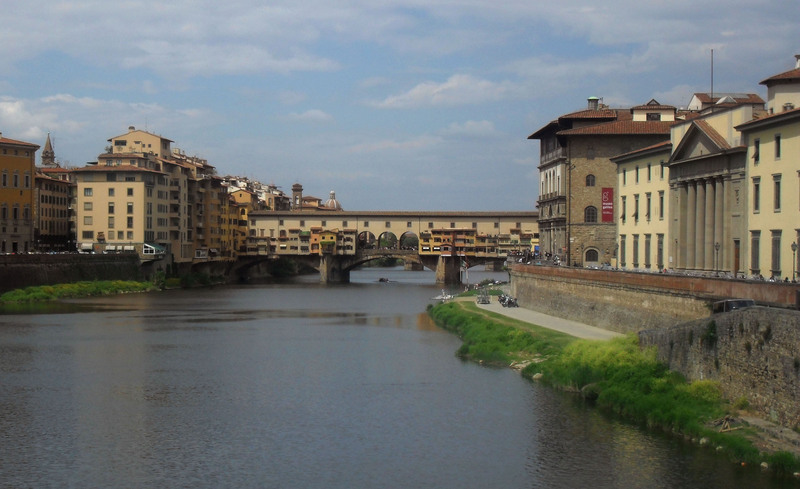 Although Ponte Vecchio was charming – a patchwork jumble of pink and yellow houses stacked on top of a bridge, reaching from the Uffizi to Via de Guicciardini, a large street of shops, mostly jewellery boutiques and gelatarias aimed for tourists – my favourite part of going to see the bridge was being on the river and looking at the buildings on its southern side. Many of them were painted in warm yellows, oranges, reds and pinks, some of them peeling around the edges and others vibrant in the sunlight. In the evening sun the hills were an invitation to explore more of Tuscany. Night-time was quieter – the stone streets glowed in the warm lights and smaller crowds gathered around street performers – one a busker who destroyed Boulevard of Broken Dreams, and one a magician with a Charlie Chaplin moustache and a costume to match. We must have joined the audience after he finished a trick, because he was making a yellow balloon animal for a tiny, blonde girl standing with him in the centre of a square of people. He held it out to her, and then snatched it away as she reached for it. She lowered her arms and he lowered it to her, and snatched it away again. When he finally gave her the balloon dog, he held out his hat to her, and she tried to hand the dog back. He shook his head, tweeting a whistle for emphasis and pointed into the hat. She held out the dog again. He gently pushed the dog back to her and pointed to the hat with a tweet. She held out the dog. Then her sister strode into the arena and gave the little girl a coin. The magician followed her back to the audience and pointed to his hat with a shrill squeak. The sister gave him a coin. See? He displayed his hat to the audience with all the polish of a Wheel of Fortune woman. He returned to his assistant, the little girl, and whistled at her to put the money in the hat, and she happily obliged. He then patted her on the head and blew the whistle, pointing her back to the audience. She began to walk and he blew the whistle again – I think it was supposed to be a cue for applause – and she took this as a summons and walked back to him. He shook his head, smiling around the whistle, and pointed her back to her family. She turned, and he whistled again! She marched back and forth as he squeaked and pointed, starting to look a bit dizzy. Eventually he pointed her back to the audience one last time. She stared at him uncertainly – was it another trick? He whistled and pointed, stamping his foot. She stood still. He whistled and gently pushed her away, and prompted the audience into another round of applause. The next day we left and, looking over my map as I write this, I can’t believe how little we saw. Although we walked around most things in the centre, I can’t identify them by their names. And despite staying right near the enormous Ex Fortezza da Basso, I never saw what was inside its walls. Oh for one more day in Florence! Maybe even two. 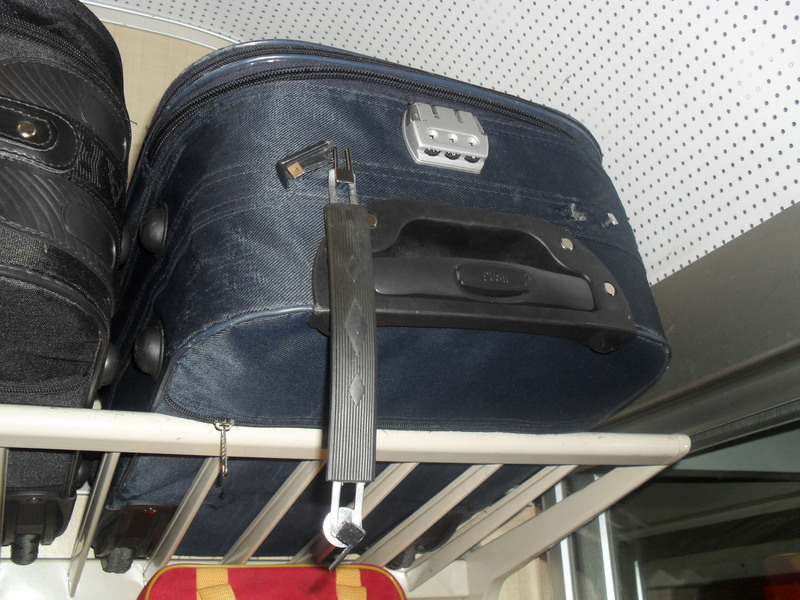 On the train between Florence and Naples, one side of the top handle came out. Ironically, the other side is clinging on with such determination that I can’t even cut it out.